(Nanowerk News) Graphene sheets are strong and stable, and have highly mobile charge carriers that could make them prime components in nanometer-scale electronics. 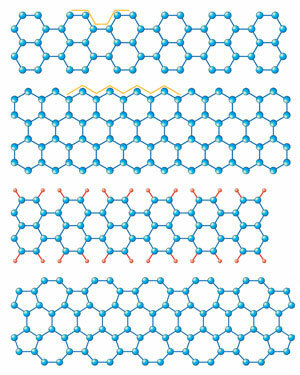 In particular, very narrow graphene ribbons could act as excellent circuit connectors. However, new calculations by Chilla Reddy at the Institute of High Performance Computing of A*STAR, Singapore, and co-workers have shown that narrow-width ribbons—ten nanometers wide or less—have a strong effect on the elastic properties of graphene ("Edge elastic properties of defect-free single-layer graphene sheets). “Researchers are trying to use narrow graphene sheets with widths less than ten nanometers for electronic applications,” says Reddy. At this width, however, the elastic properties of the ribbon’s edges produce three-dimensional ripples in the graphene. The ripples arise because, while the bulk of a graphene sheet has a uniform honeycomb-type structure, the edges can have a variety of different atomic forms that cause either compression (squashing) or tension (stretching). The ripples can change the potential energy and electronic properties of the sheet. To investigate exactly how different edge structures may affect overall electronic performance, Reddy and co-workers calculated the elastic properties of an ideal graphene sheet subjected to strain. They considered several different edge structures including ‘zigzag’ and ‘armchair’ edges, with and without hydrogen atoms bound to them, and ‘reconstructed’ edges that included pentagons or heptagons (Fig. 1). Fig. 1: Schematic diagram showing graphene ribbons with different edge structures. From top: ‘armchair’ edges and ‘zigzag’ edges (outlined in yellow), armchair edges terminated with hydrogen atoms (red), and zigzag edges reconstructed with pentagons and heptagons. The researchers found that when sheets are wider than ten nanometers, the edge effect becomes insignificant, and there is no residual strain. When they are at this width or less, however, their elastic properties change dramatically. The calculations predicted that the zigzag and armchair structured edges were under compression, while the reconstructed edges added tension to the edge of the sheets. This suggests that the reconstruction of edges into pentagons or heptagons can completely change the edge stresses from squashing to stretching. Reddy and co-workers are now studying the edge morphologies of graphene sheets that are arranged in multiple layers, folded, or functionalized with different chemicals. Their work implies that researchers could one day control the electronic properties of graphene by selecting ribbons with specific edge structures.